A few words on what we can offer. The snow is getting thin and the sun is feeling warmer as I sit here looking out at green patches on my lawn. It won't be long before our bikes are started and we'll be wondering where to go and what to do on them. For 2014 we'd like to revive the old tradition of the Grand Tour. I believe we have previously done grand tours of NS Lighthouses and Ferries. The idea is to go individually, or as a group, at any time throughout the year, and document your visit to designated sites. Individuals who complete the series are justifiably acknowledged as superior beings and awarded a coveted prize. For 2014, we have selected 25 historical sites to visit, that will take you to most of Nova Scotia in the process of visiting them. You don't actually have to enter many, just take your picture at a sign or identifiable indicator, but I would discourage this. Why not slow down, enjoy the site at a leisurely pace and learn as much as you can about our wonderful province? The prizes listed are tentative. John tells me our treasury is flush, so we may be able to come up with something better unless everyone completes the tour! Nova Scotia is one of the best areas in North America for motorcycle riding, so let's take advantage of the wonderful opportunity we have to ride and enjoy the roads we pay for. The sites are given on the attached sheet along with the approximate locations. You may need a Doers and Dreamers map to help locate some. Have fun! Québec - Nova Scotia get-together in Grand Falls NB. Again, this year the New Brunswick rally will take place at Grand Fall. I believe it's will be the 5th edition meeting the Quebec riders at this location. We were lucky to be able to reserve the cottage for August 3 and 4 (Friday night and Saturday Night) which is the long week end of Natal day. Please mark it on your calendar and let me know if you are planning to attend. July 17, 2011. Day ride called by Bill. Bill called a ride with the suggestion to ride to Cape George. Mark Mayer, Bertrand, Shereef and Bill ended up riding to Bridgewater via Peggys Cove, Lunenburg, and Riverport. It was 20 degrees in some places and over 30 in others. Had lunch at the Pub in Mahone Bay. Ed. note: That is what makes our rides successful: the group sets up the dynamics . One suggestion can easily change to another . In the end the ride determines the success of the days outing. July 10, 2011. Visit to Fall River Fire Fighter museum and ride. Nine members and quest of the BMWONS club met at Sunny side to then ride to the Fall River Fire Fighters museum in Fall River, NS. The museum is trying to publicize itself and the Provincial Gov't will supply directional signage to the museum off the HIghways if they can show a particular amount of visitors per museum season. I believe the figure may be 1000. Thus the BMWONS club helped by visiting today. The museum has some interesting artifacts and displays and is fun for everyone. This club encourages the viewers to this website to visit the museum so that it may qualify for the much needed signage. 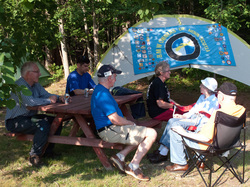 The 41st Bluenose Rally , July 1 - 3, 2011, was attended by about 15 members of the BMW Owners of Nova Scotia. The Bavarian Happy Hour was well received on friday evening and by all accounts was warmly received. Stay tuned for a few changes to how we do this for next year. John Engweiler took home the Oldest Rallyist award and plans to get many more, he announced to everyone. We did not claim our usual spot as in other years but we managed to assemble a sizable BMW Owners group together to make for a good weekend of club comraderie. See the Photo section under the 2011 photos section for some rally pictures. The Kelty Sun Shade ( (Club asset number 2) has been recovered. It was mistakingly and securely housed by a member who was unaware of this particular possesion. Thanks all for looking and to the sucessful recovery. Comment on the Mountain Gap rendezvous by Prez. Peter Rouleau. had a great time and surprising enough we were able to dodge most of the rain. and eat in the same place. Any ideas folks? PS. For those that did not come, we missed you! Weather looks good for a Sunday ride. Meet at the usual place, Tim Hortons, Sunnyside Mall in Bedford at 10am. How about another ride to the Valley? First stop at the downtown Tim Hortons in Windsor around 11:30am. Nice club ride today. A big thank you to the 13 people who showed up. Best turnout of the year so far. 2011 May 7, 9:32 AM - posted from Bill's email. Looks like we can meet for a club ride tomorrow (2011 May 8). Last night the weather channel said it would rain and a high of 11 degrees, this morning they are calling for 15 degrees and sunny. Time to ride. Meet at the usual place, Tim Hortons, Sunnyside Mall at 10am. Route to be decided then. Reminder: When you hear about a ride departing from the Sunnyside mall, Bedford we usually assemble between the RBC ATM and the Tim Hortons facing it. The Sunny side mall is the mall with Pete's Frootique in it. If you have news that is pertinent to the club let us know using the contact form. Thanks for visiting, feel free to participate in discussions and rides.